Review the details of the Gear Bins here. 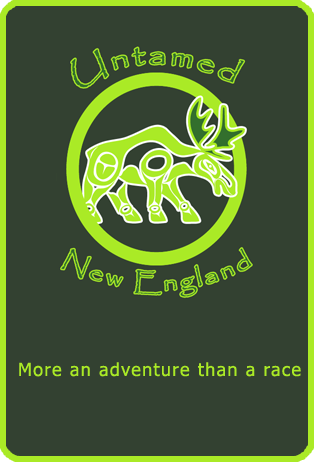 PERSONAL RESPONSIBILITY AND ASSUMPTIONS - You and your team are responsible for carrying suitable and appropriate equipment, clothing, and sustenance for the climate, conditions, and activities in the Untamed New England Expedition Race. This Mandatory Equipment List is NOT a list of the only items you should take. It contains the mandatory items that you and your team must carry with you, at specified times, to meet minimum safety requirements by law, prevent and/or treat SOME potential injuries, and short term survival purposes (for example: a seriously injured team member, in a stationary position, overnight in bad weather). It assumes your team members will NOT separate during the race and that you may share between members the mandatory equipment that must be carried. You will certainly need additional equipment, clothing, food, and drink for your participation in the event. RULES - You and your team are required to carry the mandatory equipment items with you at the specified times. Checks of mandatory equipment may occur during the race and missing equipment may result in penalties or disqualification as per the race rules. If any items are used, consumed, or lost during a section of the race, they must be replaced at the next transition point. The mandatory equipment is divided into two categories, equipment you and your team must carry at ALL times, and equipment you and your team must carry during a specific DISCIPLINE. Official Race Bib 1 x per competitor The official race bib must be worn by each competitor at all times as the outermost garment. Vest/packs that cover the front of the bib are not permitted (where the big over items such as PFDs etc). Race bibs are provided by the race organisers. Whistle 1 x per competitor Each competitor must carry at all times a whistle that is pea-less and functional in wet conditions. It must be easily accessible at all times to sound an alert if required. Light Source (Headlamp) 1 x per competitor Light source (such as headlamp), waterproof with the required batteries for the section of the race. Different light sources may be used in different disciplines e.g. headlamp, cycle lights. Shell Layer Top (Jacket) 1 x per competitor The shell/ outer layer jacket must be waterproof, windproof, breathable as specified by the manufacturer. Jacket must have hood, seams tape sealed and be suitable for potentially extreme conditions in an adventure race. Shell Layer Bottom (Pants) 1 x per competitor The shell/ outer layer pants must be waterproof and windproof as specified by the manufacturer. Pants must be suitable for potentially extreme conditions in an adventure race. Mid Layer Top (Fleece) 1 x per competitor The mid layer top is used between the baselayer and shell layer to provide additional insulation in cold environments. Long sleeve top of synthetic or wool fabric. Mid-weight, moisture wicking and quick drying. Top may either be carried or worn. When tested on scales the total weight of the top must be 200 grams or greater. Baselayer Head (Beenie) 1 x per competitor Beanie (or Buff) must be close fitting and of synthetic or wool fabric. Lightweight, moisture wicking/quick drying, and worn over your hair/skin. Beanie may either be carried or worn. Sleeping Bag 1 x per competitor Full length sleeping bag or heat reflective breathable bivy sack. (not enclosed survival/space blanket) When tested on scales the weight of the bag must be 150 grams or greater. Primary purpose is warmth. Survival Blanket (Space Blanket) 1 x per competitor Sheet or bag of material coated in a metallic reflective agent. Used in emergencies to reflect heat. Can be used to counter hypothermia, but also provide shade or aid in visibility. (note bags can deteriorate over time). Emergency Shelter (Tent or Bothy Bag) 1 x per team Tents must have sewn in floor and minimum floor area of 2.5m² or 27ft². Tent design must include poles. All the required poles, pegs, ropes etc must be carried with the tent. Must be suitable for potential conditions of the race. Another option is a "bothy bag" rated for 4 people (not 2 x 2-person bags) made from waterproof & windproof material and containing air vents. When tested on scales the weight of the bothy bag must be 400 grams or greater. For 2-person teams, the "bothy bag" can be rated for 2 people (1 2-person bag); tent minimum floor area of 22ft² is acceptable for 2-person teams. Magnetic Compass 2 x per team Quality compasses for accurate navigation. Compass must have a needle balanced to the magnetic "Zone 1" for the New England region). Fire Starting Device 1 x per team Waterproof matches, gas cigarette lighter, flint and steel are all acceptable fire starting devices. Knife 1 x per team Minimum blade length 50mm and sharp enough to cut rope or webbing in an emergency. Folding blade for safety. Must be easily accessible while kayaking. First Aid Kit 1 x per team First Aid contents specified separately. Must be contained in waterproof bag. Strobe Light 1 x per team Must be white light, high intensity (e.g. Xenon strobe lamp), 360 degree visibility, waterproof to 10m or greater, visible beyond 1nm (1.9km) and with charged batteries. Normal flash rate 60 per minute. It can be used in an emergency situation (on both land and sea) to alert others to your location. Headlamps or cycle lamps that flash are not acceptable. Mobile Phone 1 x per team A fully charged mobile phone capable of calling and receiving calls from a US phone. This will be confirmed at check-in. Race staff will power off the phone, then seal the phone before returning it to you, so be prepared to have that phone unavailable to you after check-in. Mountain Bike 1 x per competitor Mountain Bike appropriate for adventure racing. No road or cyclocross bikes. Front Light 1 x per competitor Front facing white light. May be head or handlebar mounted. Rear Light 1 x per competitor Rear facing red light. Must be mounted on the bicycle. Recommended spare rear light is carried amongst team. Recommended Biking Items - While not mandatory, we recommend teams have a bike repair kit, spare bike tubes, pumps or inflators, and other equipment to handle basic maintenance situations for mountain biking. Personal Flotation Device (PFD/ Lifejacket) 1 x per competitor Correctly sized for the competitor and must meet US safety standards Type III or better. Worn at all times while paddling. Inflatable vests of any type are NOT acceptable. Whistle 1 x per competitor Must be attached to the PFD/ Lifejacket. Paddle 1 x per competitor We recommend kayak paddles as these can be applicable to both canoes and kayaks -- while one can use a canoe paddle in a kayak, it's certainly not recommended. Helmet 1 x per competitor Worn as directed by race organisers. Throw Bag 2 x per team Rescue device with length of rope stuffed loosely into a bag so it can run out through the top when thrown to a person. Minimum rope length 10m/30ft. For 2-person teams, 1 throw bag is sufficient. Glow Sticks 4 x per competitor At night, one glow stick attached to PFD in a highly visible position at all times (i.e. shoulder position). At night, one glow stick attached to canoe or kayak (bring cable ties). Glow sticks must be glowing when dark. Knife 1 x per competitor Must be attached to the PFD. Bandage (Elastic/ Crepe) 2m long x 7.5cm wide Total length of bandage is minimum of 2 metres and minimum width is 7.5cm un-stretched. Multiple bandages are permitted. Used to create localised pressure to site of injury or wound. Triangular Bandage 1x This bandage in shape of right angle triangle can be used to make a sling, as normal bandage and other applications. Wound Dressing (Sterile) 2x Dressing minimum dimensions 7.5cm x 7.5cm each. Applied to wound to prevent further harm and promote healing. Self adhesive or used in conjunction with a bandage. Gauze dressing with nonstick film recommended. Strapping Tape (Adhesive/ surgical tape) 1x One roll of strapping tape. Can be used to secure bandages or dressings and in improvised splints. Antihistamine (strong) 4 x adult doses minimum Antihistamine tablets inhibits the action of histamines and can be taken in event of allergic reaction. Recommended First Aid Items - Additional first aid items that are highly recommended include analgesics (pain reliever e.g. Advil), anti-inflammatory tablets (e.g. ibuprofen), electrolyte replacement, antidiarrheic, disinfectant and antiseptic solutions/creams, blister treatment, CPR face shield, medical gloves, and epi-pens for those with serious allergies.